She is incredibly good at what she does and is a force to be reckoned with in the courtroom. She is impressive and a safe pair of hands: I would want her on my side at all times. A strong litigator who is particularly good at really contentious work. Her advocacy skills are highly impressive and her career is on an upward trajectory. Brie is recommended as a leading silk in the latest editions of The Legal 500 and Chambers UK . She recently won Barrister of the Year at the Modern Law Awards (2019) and Chambers UK’s Real Estate Silk of the Year Award (2017). She is a client focused property barrister experienced at dealing with all aspects of property litigation, property related probate and professional negligence as well as franchising. Brie’s successful property practice, focusing in particular on real property, property development and, the more commercial aspects of property work continues to flourish. In addition she has developed a strong reputation for her contentious probate work, which frequently involves property issues. Property related professional negligence (particularly involving solicitors and surveyors), probate (often involving property issues) and franchising form the balance of Brie’s practice. Mediation is the other string to Brie’s bow. She has a great deal of experience of mediation from both angles: as a mediator and representing clients in mediations. She is increasingly in demand in both capacities and works as a mediator privately and in the FTT. Brie’s preferred form of transport is a motor cycle. She has a reputation for enjoying activities like bungee jumping, roller coasters, body flying and travel to far flung places such as the North Pole, Iran and Kurdistan. Brie is also able to accept direct access instructions and is often instructed to provide an initial assessment of prospects and strategic advice. Brie acts for both commercial landlords and tenants handling both contentious and increasingly non-contentious advisory work. She also has extensive experience dealing with break clauses, rent reviews, dilapidations and consents. Brie’s clients range from the institutional (including local authorities and their pension funds) and corporate to the individual. TST Millbank LLC v Resolution Real Estate Feb 2018 & Jan 2018 (unreported) Successful £1m service charge claim plus refusal of relief from sanctions striking out of counterclaim related to VAT on service charges. Advising on claims against commercial landlord for disruption due to redevelopment of the remainder of the building notwithstanding reserved rights to develop and scaffold. Lilyford Ltd v La Porta ChD 15 March 2013 – Abuse of process and issue estoppel in proceedings involving forfeiture, wrongful forfeiture and relief. Construing usual and bespoke rent review provisions dating back nearly 100 years. Resisting relief from forfeiture based on illegal user and sub-division of premises. Acting for local authority forfeiting lease of car parks for arrears and resisting misrepresentation claim raised after a negotiated surrender and regrant of a lease. Acting for a landlord pursued in connection with the consequences of fire and water leaks and associated insurance. Resisting relief from forfeiture for arrears of rent on the basis of other breaches including illegal user. Acting for a landlord faced with a claim based on breach of regulations relating to electrical installations. Acting for a landlord pursued in connection with water leaks that emanated from other tenants units and a fire where the claims were based on the water ingress, the failure to secure adequate insurance and the failure to pursue insurance claims. Parsons v George & anor. EWCA Civ 912 – Limitation in the context of an application for new tenancy under the 1954 Act. Brie has considerable expertise of disputes involving developers, land owners, joint venture partners raising both property and contractual issues. Re Vastint: Final injunction obtained to protect a development site from the real threat of incursions related to illegal raves and travellers taking up occupation. The gives give a clear analysis of the principles applicable to quia timet injunctions and injunctions against persons identified only by reference to the wrongful activity. Acting for a developer seeking to enforce a conditional contract and associated option to enable a major mixed use development. Resisting a high profile developer’s forfeiture of deposits by challenging the validity of the contracts for the purchase of long leases of apartment hotel rooms entered into at sales fairs. Westcoast Holdings v Wharf Land Subsidiary (No 1) Ltd  EWCA Civ 1003 – Property development JV agreement and associated loan. An appeal against summary judgment for repayment of a loan and the refusal of claims declarations inhibiting the lender’s entitlement to judgment for monies owed and to enforce judgment. Advising on the proper construction of overage provisions for a substantial mixed development where the nature of the development had changed considerable. Advising on the compromise of a right to light claim arising out of the construction of a new office block in a largely residential but significantly built up area. Drafting overage provisions for a substantial development plot where the overage was to be paid in stages including when development started and as each unit was sold. Advising on implied and prescriptive rights of way affecting a development. in particular resisting an injunction and quantifying damages in lieu. Acting for a developer land owner seeking to avoid a conditional contract for the sale and construction of part of a major mixed use development. Bond v Dunster  EWCA Civ 455 – Appeal against findings that the parties entered a property development agreement where judgment took 22 months. Barratt North London v JM Rowe (Investments) Ltd  EWCA Civ 548 &  EWHC 1987 – A conditional contract for purchase of land, redevelopment and lease back of part. A successful claim for return of a deposit following rescission of the contract. Defences based on construction, election, estoppel by convention and the principle that a party cannot benefit from its own wrong. Brie handles cases relating to short term tenancies including issues relating to possession, breach of tenancy and deposit schemes. Charamlambous v Ng  1 WLR 3018 – Assured shorthold tenancies, Deposit schemes and retrospective legislation. Dispute about the existence and succession of a Rent Act tenancy and the effectiveness of a notice to quit served on the public trustee but addressed to the occupant were in issue. Brie’s residential L&T work is focuses on the development and management of estates and properties subject to long leases and the statutory interference with freeholder’s interests. Reiner v Triplark  UKUT 524 (LC);  EWCA Civ 2151: Breach of alienations provisions by unregistered assignment – meaning of “parting with possession” Consent to assignment and breach of “landlords” statutory duty when RTM in place. Advising a developer how to structure their proposed mix development to avoid and/or limit the statutory pre-emption rights. Advising how to negotiate and avoid the statutory controls on long term contracts for supplies and services. Acting for a local authority recovering a developer on the creation of long term contacts for the supply of services electricity supply. Acting for a landlord and multiple leaseholder supporting and application for the appointment of an Manager in place of an RTM. Mediating a substantial ongoing service charge dispute relating to provision of porters, porter’s flats and charges for maintenance of communal gardens in exclusive West End estate. Artist Court Collective v Khan – Unreported 26 October 2015 – Leaseholder’s pre-emption rights – creations and termination of a trust relating to the landlord’s interest. Defending a freeholder’s claim for orders requiring the laying of fully fitted carpet against the long leaseholder who installed hard wood and other floors with sound proofing in a high class residential flat in place of carpeting. Advising on leaseholder’s premption rights following disposal of legal but not beneficial interest in a freehold. Appealing a refusal of dispensation of the consultation provisions relating to service charges for works in excess of £250,000. Advising upon the ability to pursue the right of pre-emption against a purchaser after many years and limited information was known to the lessees. Advising on the entitlement of various intermediate landlords upon enfranchisement. Brie has considerable experience of a wide variety of real property issues including restrictive covenants, easements, boundaries, overage provisions and other aspects of residential and mixed use property development give her the ability to form insightful commercial assessments quickly. She is also well versed in advising on conveyancing and registration issues under significant time pressures if needed. Brie’s ability to think strategically aligned with her excellent and adaptable communication skills make her equally popular with clients in disputes with commercial partners or family members. Brie has extensive experience of mediation both as an advocate and mediator across the full range of property disputes. Rabiu v Marlbray Ltd  1 WLR 5147 – Exchange, authority and ratification in a contracts for the purchase of land. Section 2 LP(MP)A 1989. The enforceability of a contract for the purchase of a leases by joint tenants where only one proposed joint tenant participates. Advising on the enforceability of restrictive covenants by a high profile educational institution over church property. Skelwith (Leisure) Ltd v Armstrong  Ch 345 – Unregistered assignment of registered legal mortgage. Consideration of the status and powers (particularly the power of sale) of the equitable assignee. Acting for an agricultural land owner claiming a right of way for agricultural purposes over several fields. Advising on the protection of charging orders over alleged beneficial interests and a freezing order against the registered title of multiple properties in a complex fraud. Acting for owners of properties in a remote hamlet resisting an adverse possession of claim to the wastes in the centre of the hamlet. Greenmanor v Pilford  EWCA Civ 756 – Appeal against refusal of injunction and damages in lieu for regular vehicular access in excess of limited vehicular rights of way associated with a limited right to park. Appeal against finding of adverse possession. Haq v Island Homes Housing Association & L B of Tower Hamlets  EWCA Civ 805 – Successful appeal against a finding of proprietary estoppel giving rise to a 60 year business tenancy at 15% market rent. Considering the relationship between and effect of “subject to contract” negotiations and proprietary estoppel. Bashir v Ali  EWCA Civ 707 – The proper construction of a contract for purchase of land at auction. Sale of freehold subject to leases. The parties were unaware of a studio flat within the property and the contract made no mention of the studio flat. Successfully appealing to establish on true construction the sale was a sale of the freehold subject to the leases mentioned only. McPherson v Legal Services Commission  EWHC 2865 (Ch) – An appeal addressing the meaning of “preservation or recovery of property” for the purposes of the creation of a statutory charge in favour of the LSC. Bank of Scotland v Etridge  4 All ER 705 – Seminal and highly influential case concerning mortgages and undue influence. Disputes involving trusts of land have been a consistent feature of Brie’s practice whether they arise on the breakdown of family or other relationships or out of joint ventures and development projects. Brie brings her considerable interpersonal skills to such disputes where appropriate and has as a result is frequently used as a mediator as well. Acting for the beneficiaries resisting father’s challenging validity of deceased mother’s notice of severance relating to only significant asset in her estate. Defending £30M claim by estate to recover properties in China, Hong Kong and UK purchased in the deceased’s girlfriend’s name with money provided over a period of years on the basis the properties were held on trust and/or funds acquired by undue influence. Multiple million pound trust of land dispute (arising out of an Inheritance Act claim for a disabled adult child) the major asset of the deceased and involving issues of incapacity and undue influence. Acting in a claim by a builder for an interest in property which he developed on the understanding he acquired an interest. Dispute about the existence and effect of a trust of land involving a mother and adult daughter between the beneficiaries of the estates of both. Claim between ex-husband and wife over property acquired when reconciled and signed over the ex-husband on the basis of assurances. Acting in a claim by mother against son for interest in property she invested in and provided funds for the construction of a granny annex. Brie handles a wide variety of contentious probate work. Although this often draws on her property expertise, her practice covers the full range of trust, probate and inheritance work including challenges to the validity and proper construction of both trusts and wills and actions for breach of trust. Brie’s case load covers disputes over substantial estates including foreign property, complex property issues and the ownership of business interests. She handles contested probate claims involving lack of capacity and/or undue influence, disputes relating to the construction of wills and the proper administration of estates as well as Inheritance Act claims. Brie is known for her ability to achieve a balance between the need for compassion and sensitivity on the one hand and the provision of robust practical legal advice and representation on the other. Ilott v The Blue Cross and others  2 WLR 979,  EWCA Civ 797. Advising on the effect of pre-nuptial agreements in Inheritance Act claims. Advising on the ability of the estate to recover properties in France in the name of the deceased’s girlfriend and her son which were derelict until the deceased paid for their renovation. Fuschini v Roberts & Rafferty  unreported resisting an Inheritance Act claim by a former girlfriend of Gerry Rafferty. Advising the beneficiaries of a £10M plus estate identified by the police after the deceased was murdered generally and in connection with the location of evidence and responses to claims made by former associates of the deceased that properties were held by him as trustee. Advising on the estate of a war hero including the effect of trusts created pursuant to a “gift from the nation”. Wharton v Bancroft  EWHC 3250 &  EWHC 91 – Contentious probate involving challenge to will on the basis of knowledge and approval and undue influence. Costs, Part 36 and payments on account in contentious probate. Brie has experience dealing with a variety of trusts including domestic and offshore company trusts and family trust as well as all aspects of trusts affecting real property. Brie’s expertise includes drafting of trust documentation, construing express trusts, challenges to the validity or existence of trusts, variation of trust and actions between trustees and beneficiaries. Judgment for £4m obtained on behalf of 27 victims of the ‘possible frauds” perpetrated by Universal Wealth Management, a wealth planning firm that encouraged elderly individuals to set up trusts in order to avoid paying inheritance tax and care home fees. Enforcement proceedings now in operation. Courtwood Holdings SA v Woodley Properties Ltd – Courtwood Holdings SA v Woodley Properties Ltd & Ors  EWHC 2163 (Ch),  EWHC 3514 and  EWHC 1168 – Fiduciary duty and its relationship to express contractual terms. Knowing receipt of the proceeds of a breach of fiduciary duty against purchaser from LPA receivers. Interim proprietary injunction and release of funds for trust expenses prior to judgment. Acting for one of several groups of potential beneficiaries in mediation and Beddoe proceedings to resolve the distribution of misappropriated pension funds. Securing the removal of trustees for secret profits and advising on remedial constructive trust. Establishing the existence of a trust, denied by the sole trustee, and securing his removal, order for delivery up of the trust instrument , proper accounts and appointment of new trustee. Advising in connection with a challenged to a sham trust used to protect assets from creditors. Advising upon the control of a trust including premises within a religious community split into factions. Acting against trustees for exceeding their discretion under a trust and upon the resulting tracing remedies. Advising upon the winding up of a club and distribution of its assets held in trust. Brie has dealt with cases arising out of franchising for more than 20 years and is recommended as a leading practitioner in this area in Who’s Who Legal. She has had extensive experience acting for both franchisors and franchisees in claims involving misrepresentation, repudiatory breach and damages for breach as well as enforcement of restrictive covenants. Franchises dealt with include Perfect Pizza, Mr Jeeves, the Tanning Shop, Jeans West, Belle Casa, PSG, Minuteman Press International plc, Tax-Assist, Rush, Vision Express, Kall-Kwik and Tossed. Brie brings her expertise in commercial property and landlord & tenant to the fore in dealing with franchise issues where franchisee and franchisor are also landlord and tenant or where the franchise agreement gives the franchisor rights over the franchisee’s premises. Brie has been successful in mediating franchise disputes both as a mediator and as an advocate for franchisee and franchisor clients. Fraudulent misrepresentation claim made by several joint venture partners for rescission and damages plus substantial counterclaim for internally maintained overdrafts. Trial in late 2017 with confidential quantum settlement. Advising a franchisee group on termination based on the franchisor’s breach and/or derogation from grant in the context of adverse renewal terms where many franchisees were holding over. Chowdhary v Tossed Limited  EWHC 0557 – Misrepresentation claim by assignee company for representations made to assigning principal and initial franchisee. Construction and effect of non-reliance and other exclusion clauses. Advising a franchisee network on repudiation claims and release from restrictive covenants following insolvency of the franchisor. Carewatch Care Services Ltd v Focus Caring Services Ltd  EWHC 2313 (Ch) – Anti-competitive restrictions, implied good faith and repudiation in franchise agreements. Securing the termination of an underlease and franchise agreement and enforcement of immediate step in provisions following franchisee’s misappropriation of client funds. Advising an international master franchisor about the termination of the master franchise in the Middle East and the consequences for individual unauthorised franchisees in the region. MGB Printing & Design Ltd v Kall Kwik UK Limited  EWHC 624 (QB) – A successful claim against a franchisor for negligent advice and breach of contract. Brie’s extensive experience dealing with claims against solicitors and barristers can be found at the Professional Liability – Legal Professionals section of her profile. She also handles a variety of claims against other property professionals (eg surveyors, valuers) arising out of property transactions and litigation. Advising on a claim against right to light surveyors for advising no right to light existed where one did exist. BNP Mortgages Ltd v Barton Cook & Sons Ltd  1 EGLR 238 – Concerned the negligent valuation of property for a mortgage lender. Brie’s professional negligence practice dovetails with her expertise in property and probate. Her professional negligence work initially developed out of her property work and started in the late 1980s and early 1990s with claims by individuals and lenders claims against solicitors and surveyors relating to property transactions. She has extensive experience dealing with claims against solicitors arising out of property transactions, property litigation and probate matters. Acting on claim for negligence conduct probate claim including relying on inappropriate expert evidence and failure to advice on the merits and ATE cover. Acting on claim for negligent conduct of litigation resulting in claimant having to defend claim for proprietary estoppel whilst debarred from filing any evidence. Advising on multiple claims against solicitors for failing to advise properly on leasehold house purchase and onerous ground rent provisions. Acting on claim for negligent drafting of overage provisions. Acting for a mortgagee claiming against former solicitors for failure to advice the property mortgaged did not have the benefit of a right of way. Acting for nominee purchaser in substantial West London enfranchisement against solicitors who served a defective notice and caused substantial delay. Jaison Property Developments Co Ltd v Swinhoe  EWHC 2467 – Part 20 claim against solicitors for failure to advice and obtain instructions relating to personal guarantee for companies liabilities in a property development joint venture. Acting for a GPs partnership against solicitors for failing to register an option to purchase the reversionary interest on their surgery resulting in substantial complex involving the funding arrangements for GPs practices. Acting for a purchaser of a defective new build residential property against solicitors who failed to advise upon the absence of warranties, indemnities or insurance against defects in the property. 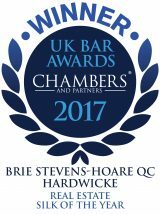 Brie is recommended in both Chambers UK and Legal 500 for real estate/property litigation. 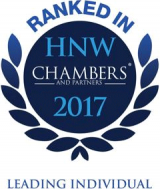 Chambers UK and Chambers High Net Worth both recommend her for Traditional Chancery. Brie supports FreeBar, a forum focused on LGBT+ people and their allies working at and for the Bar. She is also a supporter of Stonewall and a board member of Freehold, the LGBT+ property network. She regularly writes on diversity issues in publications such as The Lawyer, Counsel magazine and Legal Cheek.